First time on the pitch. Last time on the pitch. 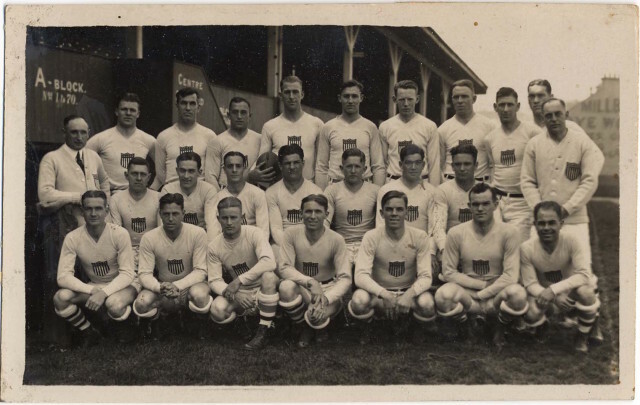 By 1924 – the U.S. Olympic Committee asked California to form a rugby team to compete in the Olympic Games – this time in Paris. UC Davis alum Colby E. ‘Babe’ Slater was elected Captain of the 1924 team by his teammates and Charlie Doe, Vice Captain – both veterans of the 1920 Olympics. ‘Babe’s’ brother Norman was also selected to represent the U.S. along with many others who were outstanding athletes in football, basketball or track, but had not necessarily played rugby previously. All but one were Californians. Since the U.S. Olympic Committee was unable to pay travel expenses, a group of leading citizens of San Francisco attended a luncheon and subscribed the city’s quota to the American Olympic Fund. Each team member had to finance other personal expenses. Babe’s local community of Woodland came out to support him, raising funds and sending him off with a gold watch and a suitcase for his luggage. 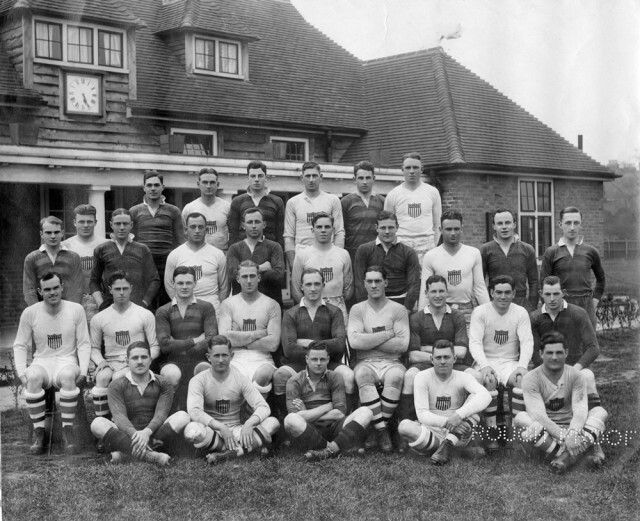 The U.S. team sailed from New York and arrived first in England to play three exhibition games against British rugby clubs in order to “get in shape” and learn the European style of playing before the Paris Olympic Games. However, when the U.S. team arrived in France, there was not as welcoming of a reception. In fact, immigration officials refused the team entry into France and the American athletes, many seasick after a rough crossing, had to force their way off the ship. The French press immediately began to reference the U.S. team as “street fighters and saloon brawlers.” When team members dared venture outside their Paris hotel, they were insulted. While they were away at practice, their locker room was ransacked and cash and valuables were stolen. 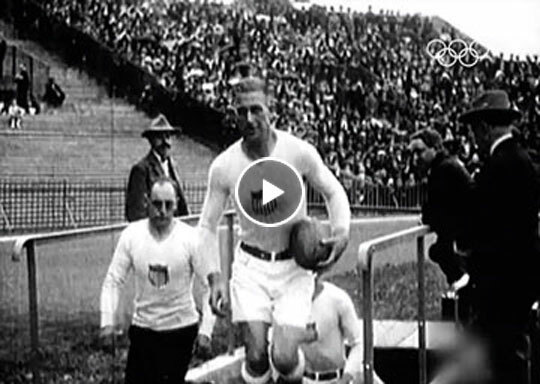 See video from the 1924 Olympic Rugby gold-medal match. Slater is seen holding the ball while leading the team out of the tunnel. The U.S. team focused on the field. After beating Romania, the team found themselves once again facing the heavily favored French in the Olympic final. On May 18, 1924, the U.S. proceeded to devastate the French team with their American football-style tackling, tethered by enormous athleticism. Leading 3-0 after the first half, the Americans steamrolled the French defense and found gold with a 17-3 victory. That day, Colombes Stadium was filled with 50,000 spectators; the surprising defeat drove French fans to riot in the stands and assault American supporters. The French threw bottles at the U.S. team and tried to break through the tall wire fence surrounding the playing field. Tens of thousands of hostile onlookers jeered at the U.S. team during the medal ceremony, the raising of the American flag and the playing of the Star Spangled Banner. After the ceremony, the U.S. team was escorted off the field by dozens of French police. Rugby was never again part of the Olympic Games, though its American Football cousin appeared as a demonstration sport at the 1932 Olympics in Los Angeles. It was the last time an oval ball was featured in the Olympic Games, though a Pre-Olympic Rugby tournament involving France, Germany, Italy and Romania was held in Berlin before the 1936 Olympics. Until now: 2016 in Rio.